Value for Money in terms of Room Area. 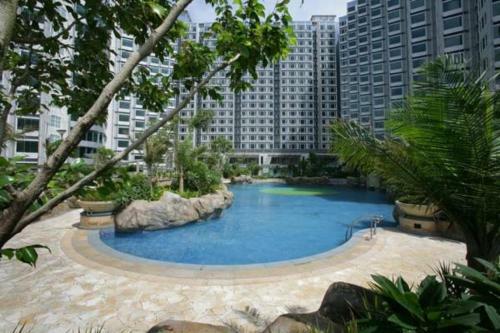 Location- Little away from Hung Hom Metro( about 800 Meters), but Hotel transfer available till Harbour Plaza Metropolis. I love this hotel. It’s worth the money. Also, I left my camera on my seat at breakfast and I totally forgot about it. But the staff were able to return it to me. They remembered my face! Lol. But truly the best thing about the hotel is the free shuttle bus every 10-20mins. The property is located in front of the Victoria Harbor which made the view quite stunning. The room was sufficient with clean bedding and kitchenware. We only stayed one night, so we did not use the kitchen. We did see there was a washer in the unit as well. The staff was nice and assisted with luggage and provided plenty of information about how to use the room safe and where the blow dryer was located. Location at the waterfront. Lots of very helpful staff. Very large appt for HK. Drinks at the bar. Excellent location. Free shuttle to City and convenient paid shuttle to Airport. It is a nice touch that you provide a smartphone with maps to navigate Hong Kong using the public transportation. 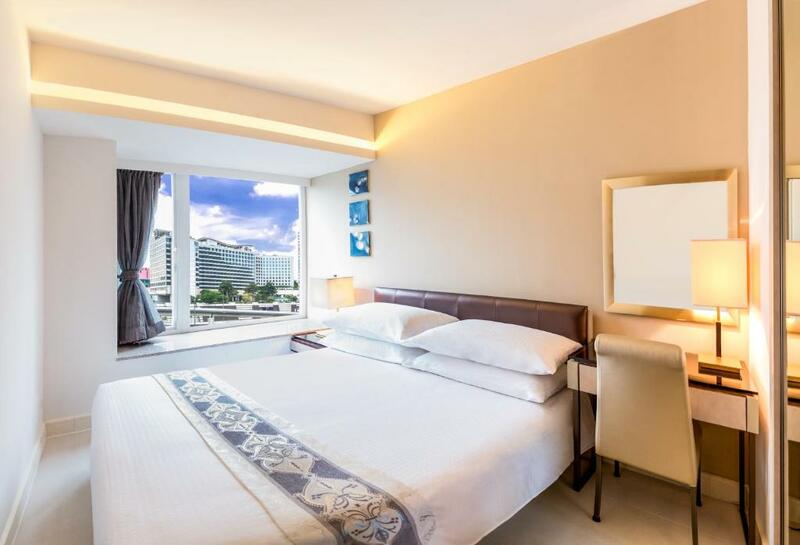 Kowloon Harbourfront Hotel This rating is a reflection of how the property compares to the industry standard when it comes to price, facilities and services available. It's based on a self-evaluation by the property. Use this rating to help choose your stay! 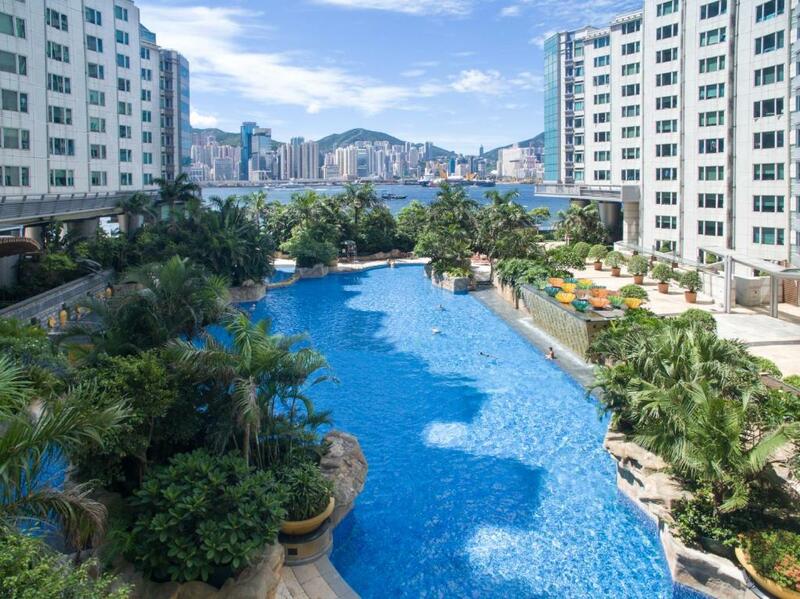 One of our top picks in Hong Kong.Kowloon Harbourfront Hotel offers accommodations in Hong Kong. This waterfront accommodations offers magnificent harbor views. 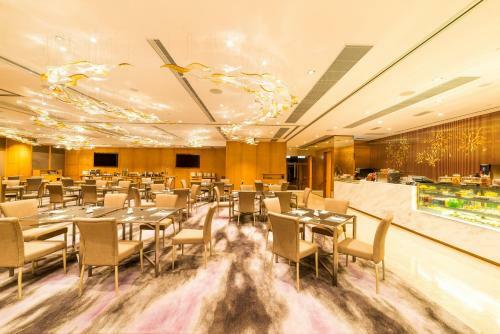 Kowloon Harbourfront Hotel is a 5-minute walk from Hong Kong Coliseum and a 10-minute walk from Hung Hom MRT Station. It takes 10 minutes by taxi to Tsim Sha Tsui Shopping Area. Hong Kong International Airport is 40 minutes' drive away. Every room comes with a flat-screen TV with satellite channels. Some units include a seating area for your convenience. You will find a kettle in the room. Each room includes a private bathroom fitted with a bath. Extras include slippers, free toiletries and a hair dryer. A TV is featured. Located at the hotel’s ground floor next to the lobby, Café D is currently serving quality continental breakfast, light meals, coffee, cake and bakery items. 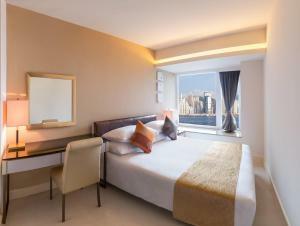 When would you like to stay at Kowloon Harbourfront Hotel? Boasted to a vibrant cityscape, this 2-bedroom city view suites offer a modern space that feels like a world away. Each suite is elegantly and tastefully furnished with a well-designed pantry, cozy furniture and modern amenities such as broadband access and audio-visual system to ensure everything is handy in this homely residence. Public parking is available on site (reservation is not needed) and costs HKD 45 per hour. Effortlessly embrace the sunrise every day in this 2-bedroom harbor view suites. With a well-designed pantry, cozy furniture and modern amenities such as broadband access and audio-visual system are delicately arranged, each suite has what it takes to bring the ideal metropolitan waterfront living to life. Boasted to a vibrant cityscape, this 2-bedroom city view quad suites offer a modern space that feels like a world away. Each suite is elegantly and tastefully furnished with a fully-equipped pantry, cozy furniture and modern amenities such as broadband access and audio-visual system to ensure everything is handy in this homely residence. Complimentary continental breakfast is offered for up to 4 people at maximum. 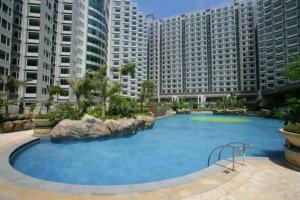 - Fabulous offers for Hong Kong tourists. Effortlessly embrace the sunrise every day from 180 degree panoramic view in this 2-bedroom harbor view quad suites. 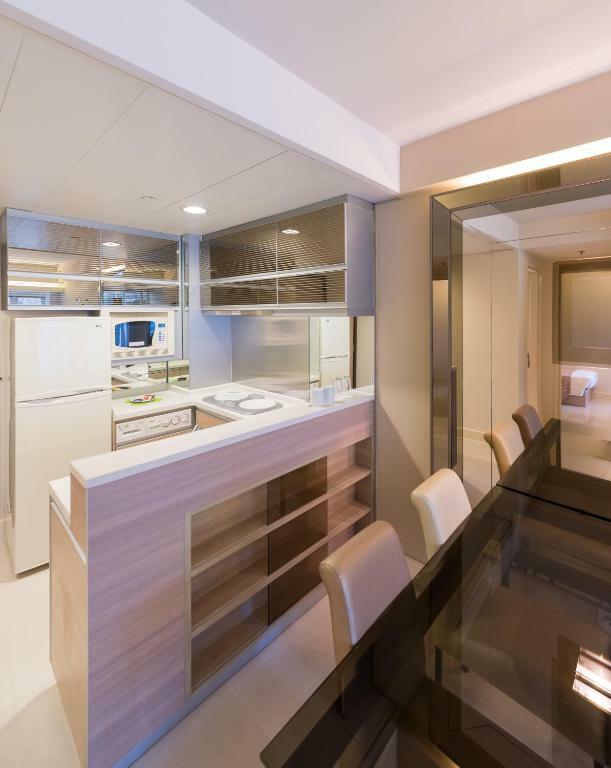 With a fully-equipped pantry, cozy furniture and modern amenities such as broadband access and audio-visual system are delicately arranged, each suite has what it takes to bring the ideal metropolitan waterfront living to life. Complementary Continental breakfast up to max 4 person. Located in the heart of Hong Kong, Kowloon Harbourfront Hotel is a all suite hotel with magnificent harbour view of Hong Kong’s spectacular skyline. All of the rooms are 2-bedroom suites, with living area and kitchenette. The Kowloon Harbourfront Hotel is situated only minutes away from the Tsim Sha Tsui, Hong Kong Coliseum and Hunghom MTR stations, the Cross Harbour Tunnel and the ferry pier. House Rules Kowloon Harbourfront Hotel takes special requests – add in the next step! Kowloon Harbourfront Hotel accepts these cards and reserves the right to temporarily hold an amount prior to arrival. 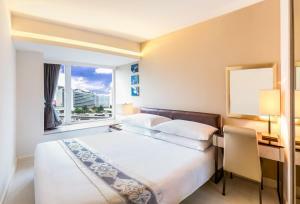 The property offers free in-room internet access for a maximum of 2 devices per room. For security reason, please present the same credit card used to guarantee your booking when checking in and paying at the hotel. Please note that third party payment will not be accepted. Please note that for all nonrefundable reservations guests are unable to modify the check-in name or date. Please note that bookers are required to offer each guest name instead of offering only one name when reserving more than 1 room. Please note that the property is residential purpose only. Wedding, party or other related activities are not allowed. The outdoor swimming pool will be closed for annual maintenance from November until early April next year. Good hotel in a convenient location. Perfect for families and the shuttle bus to city centre is so convenient! Staff are friendly and they do provide very nice breakfast buffet. Will definitely visit again. Location is a few minutes walk from anywhere else you want to be - whether you go via waterfront or ask the staff for a map of how to get to the station as its not obvious! But you can walk to the mall quicker than waiting or the shuttle bus. No towel service at pool (despite having to get pat 2 sign ins to get there and 3 lifeguards - any of these 5 could give out towels couldnt they?!). And not enough sun loungers. I ended up lying on the ground as they were all taken. There is space for a lot more so I ont know why they dont have them. Then again the ground was actually more comfortable than the sun loungers (maybe so you dont stay in them too long so they dont need so many?!) Also my kids could not get to the table tennis without an adult accompanying them. The beds were very comfortable. The swimming pool was quite nice once the sun came out! Kids liked the table tennis and fussball and gym also good. Pool shutting for an hour at lunch and shutting by 1800 every night. Nice size suite for hong kong. Nice pool and gym area. The bed was super firm and needed 2 mattress pads (or more) to make it comfortable. The hotel is dated in its decor - functional but worn. Sofa was uncomfortable and so were the dining chairs - was difficult to sit anywhere. The pool was not temperature controlled and it was freezing cold. Accessing the pool was through a convoluted way of steps and passages - not exactly easy for a child with mobility issues. For the price paid, the experience was lack lustre. Beds were incredibly hard but probably good for your back! Lovely pool and club facilities. Great shuttle service into busier areas. Superb views over the harbour. For the property the location is the compromise. It’s a ten minute walk through a quiet shopping mall to get to the train station. The cafe is not amazing and breakfast is just okay. 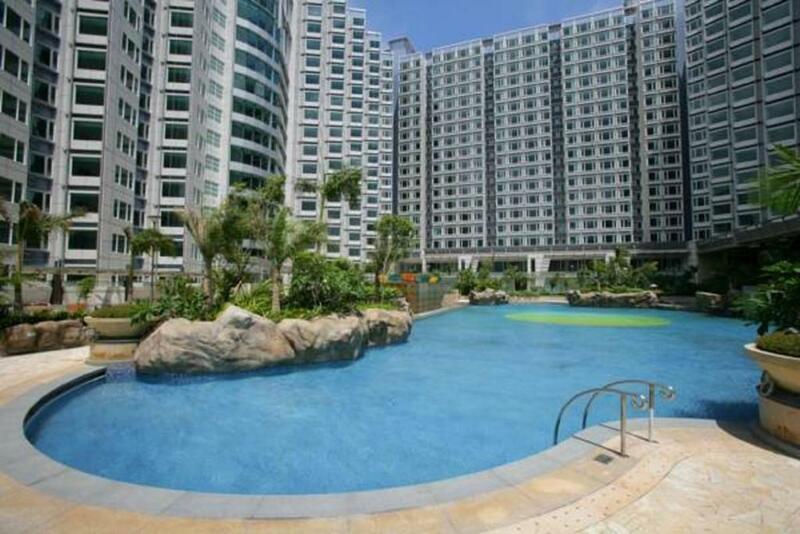 Nearest other restaurants / cafes are in the shopping mall or Whampoa all 10/15 minute walk. It’s a nice walk along the promenade to TST avenue of stars. We are a young family of four (2 and 4yo) so we really did appreciate the space in the rooms (quad, two bed harbour facing), you really can’t get that kind of value for space easily in HK. We had the 22nd top floor and splashed out for the view and it was well worth it. Kitchenette with the washing machine and Fridge is really handy. Swimming pool and kids room again really good for a young family. The breakfast is included but isn’t brilliant. Long walk for other restaurants and coffee. The free shuttle bus is great, it has two stops at the train station and Nathan Rd. The staff were very helpful and friendly and could speak good English. The rooms are a bit squeezey but for a 2 bedroom room in Kowloon for the price they were fine. Unfriendly staff no smile at all. The room, while modern and clean, lacked any form of warmth or luxury. The cold polished tiled floor throughout needed a large rug in the living zone, the rooms are small and furniture is best described as basic. There was no attention to detail and soft furnishings were missing. The room had a complete lack of comfort and ambiance. "Lifeless" The staff were not well versed on making you feel welcome. We tried to extend 1 night but were unable so we moved next door to "The Kerry". There we were made to feel welcome. We received a free upgrade and felt as if we were staying in a true 5 star luxury hotel comparable to Marina Bay Sands in Singapore. Yes The Kerry was more expensive but when comparing the two it was like chalk and cheese with the Harbourfront Hotel falling short by a long way. There is more to hospitality than providing a roof over a travellers head. The location was O.K. and the view was good too.